Located in vibrant downtown Dallas next to Belo Garden and a mile from the Kay Bailey Convention Center, this hotel puts guests in the center of it all. The Westin Dallas Downtown is located within a mile from Klyde Warren Park, the Perot Museum of Nature and Science, and the American Airlines Center. 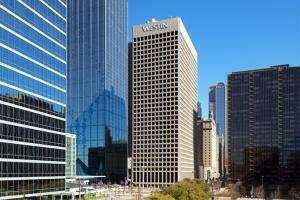 Accommodations include 326 guestroom and suites featuring views of downtown Dallas. Located in downtown Dallas, close to museums, gardens, historic buildings and much more. Grill & Vine - American bar and grill; Grill & Vine Lobby Bar. Belo Garden, Dallas Convention Center, JFK Memorial, Dallas World Aquarium, Klyde Warren Park, House of Blues, Dallas Arboretum and Botanical Gardens.